WEPAutoCrack is a pentesting tool that breaks wifi connections secured with WEP and is coded in python by Jason A. Donenfeld also known as zx2c4 who in addition to discovered the Linux Local Privilege Escalation via SUID /proc/pid/mem Write (CVE 2012-0056). 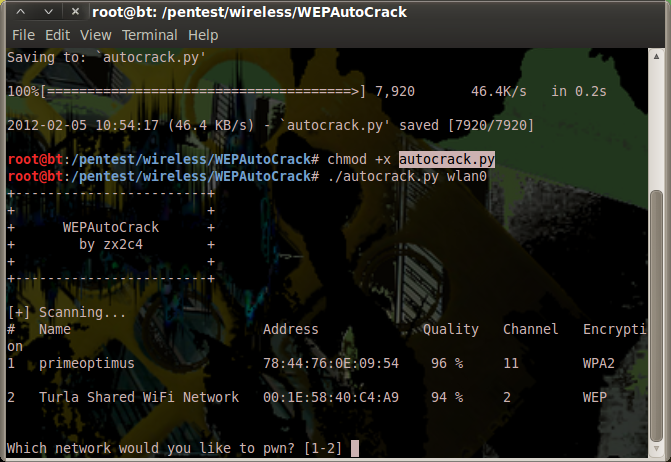 WEPAutoCrack or autocrack.py comprises of a automatic template constructor for cracking WEP networks and sets network card into monitor mode and adjusts correct channel. In other words, it’s a utility that conducts you in using the Aircrack-ng suite to crack WEP because it admits an lenient network target selection.